Below is a Simple Saturday video describing how to create a gum-wrapper chain. This project was inspired by a particular plot line in ANYWHERE BUT PARADISE. In the book, the chain serves as a way for protagonist Peggy Sue to link aspects of her life together. You’ll have to read the book to find out how and why. To download a gum-wrapper chain template access author Anne Bustard’s website at www.annebustard.com. Download the CCSS-Aligned Educator's Guide HERE! From Indiebound: Moving from Texas to Hawaii in 1960,12-year-old Peggy Sue faces a difficult transition when she is bulled as one of the few haole (white) students in her school. 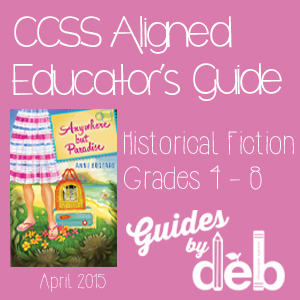 This lyrical debut novel is perfect for Common Core classroom connections. It's 1960 and Peggy Sue has just been transplanted from Texas to Hawaii for her father's new job. Her cat, Howdy, is stuck in animal quarantine, and she's baffled by Hawaiian customs and words. Worst of all, eighth grader Kiki Kahana targets Peggy Sue because she is haole--white--warning her that unless she does what Kiki wants, she will be a victim on "kill haole day," the last day of school. Peggy Sue's home ec teacher insists that she help Kiki with her sewing project or risk failing. Life looks bleak until Peggy Sue meets Malina, whose mother gives hula lessons. But when her parents take a trip to Hilo, leaving Peggy Sue at Malina's, life takes an unexpected twist in the form of a tsunami. Peggy Sue is knocked unconscious and wakes to learn that her parents safety and whereabouts are unknown. Peggy Sue has to summon all her courage to have hope that they will return safely. Folks, the guide is now available! Download it and enjoy!